Here we are again, with Episode #4! In this week’s episode, Robbie and Eric discuss the week’s newest releases, cover the return of Comics Alliance, take a look at Warren Ellis’ Nextwave, and debut a new segment: Unfounded Rumor Mill! Also featuring the triumphant return of Random Character Generator! 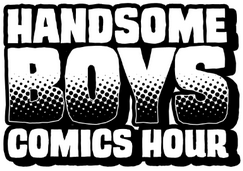 This entry was posted in Episodes and tagged agents of HATE, comic books, comics, comics alliance, handsome boys comics hour, justice league of america, new avengers, nextwave, random character generator, the wake, thief of thieves, venom on June 5, 2013 by handsomeboyscomicshour.